PARK CITY, Ks. (September 28, 2018) – Just two events remain on the 2018 race season for the National Championship Racing Association of Park City, Kansas presented by Precise Racing Products 360-ci sprint car season and four drivers are in the hunt for the division championship. The sprint car touring regulars will take to the track on Saturday night, October 6, at 81 Speedway in Park City in an event that has been moved from the originally schedules Salina Speedway stop. Also on that night’s race card will be the series modified, crate late model and mod lite divisions. One week later, on Saturday night, October 13, 29th consecutive season for the tour will come to a close at 81 Speedway where the championship and top ten in the final point standings will be solidified. Coming into the final two events on the season, three-time and defending tour champion Jeremy Campbell of Wichita, Kansas holds a slim 15-point lead over J.D. Johnson; who is looking for his first-career series championship. Don Droud, Jr. of Lincoln, Nebraska sits just 55-points out of the point lead and is looking to claim his second series championship and third for the Ochs Brothers. Still having a shot at bringing the first series championship to the “Okie” state for the first time since 1995 when Larry Neighbors of Oklahoma accomplished this feat, Norman, Oklahoma’s Danny Jennings is just 140-points out of the point lead. Jake Greider (-250), Jeff Stasa (-230), J.R. Topper (-330), Fred Mattox (-585), Kaden Taylor (-880) and Ray Seeman (-1245) round out the top ten in points. Through the eleven events that have been completed, ninety different drivers from sixteen states have competed in at least one event. Drivers having reached victory lane include Campbell, Jennings and Jonathan Cornell (2), Johnson, Droud, Blake Hahn, Tim Crawley and Jake Bubak. Both events will pay the series standard $2000 to win and $300 to start. Gates at both 81 Speedway events will open at 5:00 PM with race action set for 7:00 PM. 81 Speedway is located north of Wichita on I-135 to exit 16, then 0.7 mile west on 77th street in Park City. More track information can be found on the tracks official website race81speedway.com. 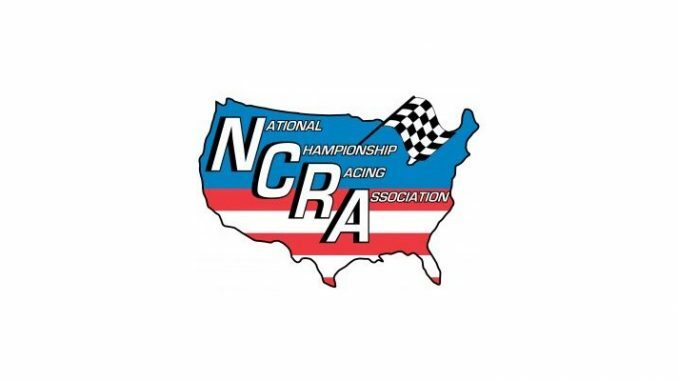 To learn more about all-things National Championship Racing Association, check out their official website www.racencra.com; their facebook page: NCRA Racing Series or call (316) 755-1781.